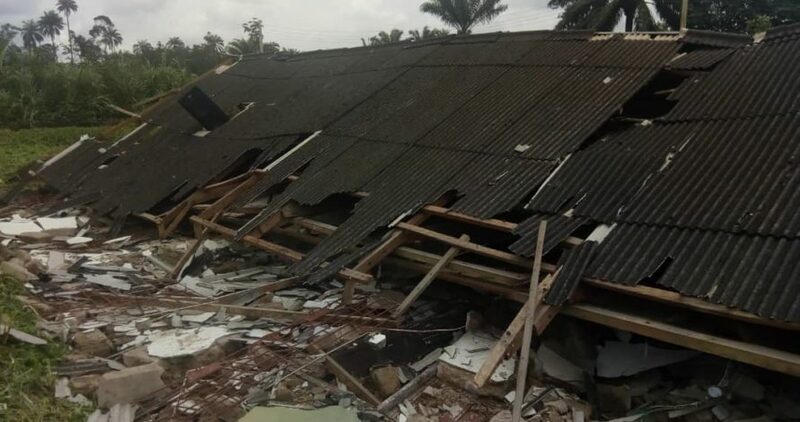 Tragedy struck on Sunday morning as an 11-year old boy was confirmed dead and scores of others sustained various degrees of injuries when a building at St. Paul’s Catholic Church, Adagbrassa in Okpe local government area of Delta collapsed during a morning mass. According to reports, father to the deceased, Jeffrey Enukanehire, the church drummer who died on the spot said: “We had just finished the morning prayer for the 7a.m mass when the wall collapsed on my son. We had gone for service in company of my wife and five children when the unfortunate incident occurred. “My son had succeeded in freeing himself from the initial wall that fell on him when another section of the building fell and crushed him to death,” he added. President Muhammadu Buhari on Sunday assured Nigerians of his commitment towards ensuring that the 2019 election is free, fair and credible. Buhari who disclosed this in Bejing during an interactive session he had with members of the Nigerian community in China, said that as a beneficiary of free and fair elections, he is not afraid of a credible process in 2019, stressing that Nigerians eligible to vote in the general elections will be allowed to freely elect candidates of their choice. ‘‘I have no fear about free and fair elections because that is what brought me to the present position. I know what I went through and very few Nigerians could boast of trying four times [contesting for the presidency]” he said. The ruling All Progressives Congress (APC) on Sunday said the Peoples Democratic Party (PDP) has already conceded defeat even before the 2019 elections, on account of its attack of APC’s adoption of direct primaries particularly to elect its presidential candidate. Spokesman of the APC, Yekini Nabena, who disclosed this in a statement, said his party was amused by the interest the PDP had in the mode of election the APC chose to adopt for the primaries to elect party candidates for the 2019 elections, stressing that the direct primaries among others ensure fairness; eliminate corrupt tendencies usually associated with the delegates system and ultimately ensure full and direct participation of party members at all levels in the election of party candidates. “We quite understand that the revolutionary and progressive idea of direct primaries to elect party candidates is strange to the PDP – a Party known for its inability to ensure internal Party democracy and actively promotes imposition of candidates against the will of its members,” the statement read. According to a statement on Sunday in Abuja by the Minister of Information and Culture, Lai Mohammed, the commendation was contained in a letter addressed to the Minister of Justice and Attorney-General of the Federation, Abubakar Malami, by Amnesty International’s Country Director, Osai Ojigho, made available to his office by the AGF. The minister added that the body said its delegates, who were invited to observe the proceedings at the third phase of the trial at Wawa Military Cantonment, Kainji, New Bussa, Niger State from July 8 to July 11, “were treated with respect and decorum,” as it expressed hope that it would also be invited to observe future trials. Fifteen persons were confirmed dead and 24 persons have so far been hospitalised from cases suspected to be gastroenteritis in Charanchi Local Government Area of Katsina. Transition Committee Chairman of the Council, Yusuf Radda, who made this known to newsmen through his Information Officer, Mannir Idris in Charanchi, said the areas affected by the outbreak were Charanchi town, Malali and Banye villages. Radda called for urgent intervention from the state government to curtail spread of the disease, as he urged people in the areas to continue to embrace both personal and environmental hygiene as part of measures to prevent further spread of the disease.